Washington, D.C. – The Administrative Codes and Registers (ACR) Section of the National Association of Secretaries of State (NASS) today announced the election of its new slate of national officers for a two-year cycle. Arizona Public Services Division Director Scott Cancelosi will serve as president of the group, which includes administrative rules professionals from the federal government and all fifty U.S. states, as well as the District of Columbia, Puerto Rico and American Samoa. Cancelosi was elected along with other ACR officers in July at the NASS summer conference in San Juan, Puerto Rico. ACR members elected Washington State Register Editor Kerry Radcliff to serve as vice-president of the organization. Kentucky Assistant Administrative Regulations Compiler Emily Caudill was selected to serve as secretary-treasurer. As the organization’s national officers, Radcliff and Caudill will work with Cancelosi to direct ACR activities, including annual conferences and a biennial survey of state rulemaking processes. The NASS Administrative Codes and Registers (ACR) Section, formed more than thirty years ago, brings together federal and state professionals—often employed by secretary of state offices—who are responsible for reviewing and compiling government rules and regulations that have been adopted and are in effect. Some members also oversee the production of “blue books,” which are the official government directory and fact book for each state. 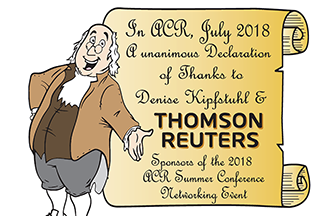 ACR members are committed to fostering the development of better rule-writing skills and rule review techniques and developing more effective management of the rule promulgation process, particularly in the publication of administrative codes and registers. They are also focused on increasing public access to the rulemaking process. In July 2012, NASS recognized the Office of the Nebraska Secretary of State with the NASS IDEAS Award for innovation and achievement in recognition of its creation of a state tracking and email notification system for proposed rules/regulations, a cross-agency application that has yielded significant savings in many areas. ACR’s new national officers will serve a two-year term from July 2012 to July 2014. Founded in 1904, the National Association of Secretaries of State is the oldest professional, non-partisan organization of public officials in the United States. Association members include the 50 states, the District of Columbia and the territories of American Samoa, Guam, Puerto Rico and the U.S. Virgin Islands. For more information, visit www.nass.org.